So I went to my first ever book signing last week at the Hudson Library. I met up with two writer friends, and then met two other book bloggers. It was a GREAT night! Twelve-year-old CeeCee is a survivor. Alone too much, and with too much responsibility because of her psychotic mother, CeeCee is old beyond her years. When her mother dies, her mostly absent father sends her south from Ohio to Savannah under the care of her never-before-seen Great Aunt Tootie. The reader is introduced to a wide assortment of Southern women, each of whom plays a role in CeeCee's healing and coming to terms with her life. Each character also helps paint a detailed picture of the dichotomy between the 'old South' with its decaying gentry, and the changing South, where black and white are more than servant/mistress and white gloves are being exchanged for jeans and flip-flops. review by Liz Murphy from The Learned Owl book store. I'm in the middle of the book now and really enjoying it! Here's Beth Hoffman talking about her background in interior design and how she became a published author. CeeCee took her four years to perfect and it is her debut novel! She got an agent and publishing deal almost immediately--OH, the stuff dreams are made of!!! Here's me with my new writer/blogger friends, Lisa and Laura from Lisa and Laura Write. 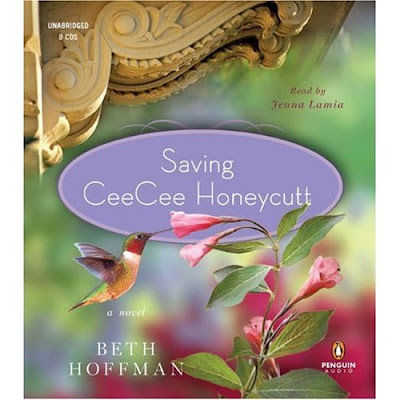 Their book The Haunting of Pemberly Brown is being published in 2011, and they share the same agent as Beth Hoffman. So it was cool to hear them shoot the breeze about agents and the publishing world (no, I was not envious at all :D). And here are the two new bloggers I met there: Stacy from Stacy's Books and Bonnie from Red Lady Reading Room. Sounds like a good read, will check amazon! It sounds like a great night! Who knew you were so gorgeous, woman! You should show yourself around here more often. So cool! Isn't it fun to meet bloggers IRL? I love that. I'll leave another comment if I get that error message in my inbox from this one! Such a fun night! We'll definitely have to hit some more book signings in the future! you will be published girl! Christine! This is so awesome. When was the book signing? Way to go girl! Sounds like a really good book. And talk about a great time. Lucky girl. The book sounds fantastic!!! Looks like you had a great time!!! That sounds like a great book! Thanks for letting us know about it! OOHHH, I'm adding this to my Read List. Thank you, sounds like this one is right up there with that bee one, can't remember the name-migraine coming on. The movie had Dakota Fanning & Queen Latifa. Good luck to you on the push-ups!! I am sick this week, so I'm not working on it right now. This must have been so much fun! I'll also check Amazon - I love finding authors I didn't know about. Thanks for stopping in to see me! What a great night. I love to read as well. Sounds like a great book! As an elementary teacher, I cherish children's books and have only been to signings by children/young adult authors. My favorite gift to give is a signed book made out to the recipient. I wish I had an agent immediately. Sigh. Does it have a happy ending? That book sounds good! I've always wanted to go to a signing...even more now that I've read this! Any day now you will be shooting the breeze about agents and the publishing world like it's no big deal. I'm jealous! All my writer friends are meeting up! You guys all look adorable. Book bloggers?! OMG - I am SO checking them out! Obsessive reading is an illness for me. Must check out - the book sounds wonderful!